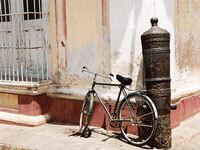 One of the most visited towns in Cuba, Trinidad maintains a charming colonial atmosphere with its uneven cobbled streets, quiet plazas, churches, red-tiled roofs, wooden shutters and wrought-iron frames. Bicycles and horse-drawn carts bump along streets lined with somewhat dilapidated pastel-coloured houses, where open doors afford brief views of folk on rocking chairs and wooden birdcages, and the strains of salsa music drift out from cool courtyards where the intricate steps of the dance are practiced. Designated a UNESCO World Heritage Site in 1988, Trinidad has largely escaped the modern tourist infrastructure and large hotels usually accorded to a popular destination, and retains its welcoming and tranquil atmosphere. Surrounded by sugarcane plantations, and situated between the Topes de Collantes Mountains and the Caribbean Sea, Trinidad's location also provides easy access to the beach, the mountains, and the beautiful surrounding countryside, where vestiges from the 18th and 19th centuries in the Valle de los Ingenios (Valley of the Sugar Mills) testify to a time of prosperity during the sugarcane boom. The Valley and its old sugar mills are interesting historically, as well as scenically, because the slave trade was a huge contributing factor in the sugarcane industry's success. It was after the abolishment of slavery that the boom ended and the area drifted into picturesque tranquillity. We are looking for contributors for our Trinidad travel guide. If you are a local, a regular traveller to Trinidad or a travel professional with time to contribute and answer occasional forum questions, please contact us.